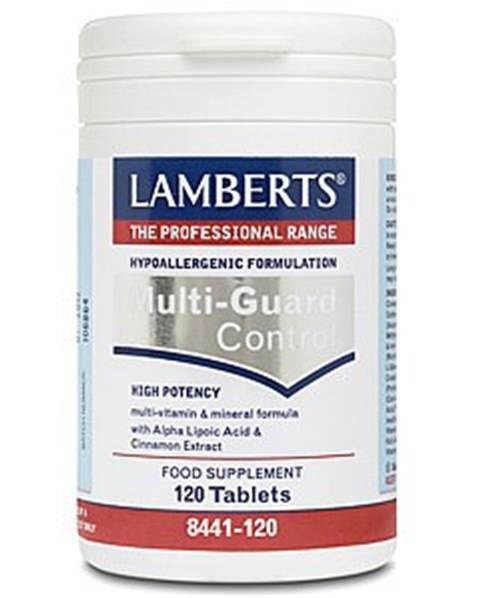 Lamberts Multi-Guard Control. High Potency multivitamin and mineral formula health supplement with Alpha Lipoic Acid and Cinnamon Extract. High Potency multi-vitamin & mineral formula with Alpha Lipoic Acid & Cinnamon Extract. Multi-Guard® Control has been formulated specially to help the body maintain a more even balance of its energy reserves between meals. This formula provides 26 nutrients at relevant levels including, per daily dose, 200µg of chromium which is probably the better known of all the blood sugar (glucose) control nutrients. We have included 300mg of magnesium since it is a component of many enzymes involved in the breakdown of blood sugar and acts as a ‘secondary messenger’ for the activity of insulin at the cellular membrane level. There is also 150mg of alpha lipoic acid as research has shown it can activate the insulin signalling cascade in cells, thus having implications for blood sugar control. Indeed studies in individuals with blood sugar imbalance have demonstrated that alpha lipoic acid may improve glucose uptake by enhancing insulin sensitivity. Studies have confirmed that cinnamon has a positive effect on glucose metabolism in individuals with blood sugar imbalance. Tests on cinnamon have indicated that it may work by helping to activate the insulin receptor, increasing insulin sensitivity. So we have incorporated a full 2000mg of cinnamon into our product, reflecting our policy to formulate our products with relevant potencies. Other nutrients that have also been shown to help support glucose utilisation include: zinc, vitamin C and in particular the vitamins B1, B3 and B6. And these nutrients are all included at significant levels. Furthermore, we have included the vitamin B6 as Pyridoxal 5-Phosphate (P5P) which is the active form. A orange/brown oval coated tablet. Microcrystalline Cellulose, Tablet Coating (Hydroxypropyl Methylcellulose, Microcrystalline Cellulose, Colours: Titanium Dioxide & Iron Oxide), Anti-caking Agents (Silicon Dioxide & Magnesium Stearate) Crosslinked Cellulose Gum. This product contains iron which if taken in excess may be harmful to very young children. Keep out of sight and reach. Long term intake of this amount of Vitamin B6 may lead to mild tingling and numbness. 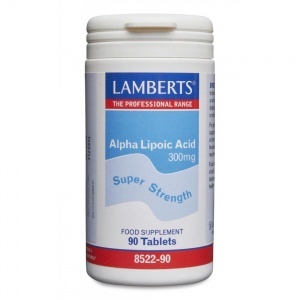 Lamberts Alpha Lipoic Acid 250mg health supplement contains important antioxidants involved in energy production.